Dallas? West End has been around since the end of the nineteenth century. Here you will find many different historical tours where you can learn about President Kennedy?s assassination in the Conspiracy Museum and Old Red Museum. Taking a walk through history is a great way to spend a day in Dallas and something you definitely shouldn?t miss out on. The West End Market Place is also an excellent area for food and shopping. 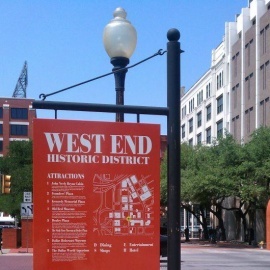 With dozens of shops to choose from, the West End was actually more known for its shopping scene before the assassination of JFK. West End entertainment and nightlife are easy to find as well. The popular music venue for many aspiring artists as well as platinum acts, House of Blues, is constantly gathering crowds for live shows, drinks and food. However if you want to avoid the big crowds, the West End Pub is a great place for food, drinks and real Texas conversation you just can?t find anywhere else.